Three generations of Sotos have lived in Nogales, Sonora, and have watched the border change and evolve. Marta Soto remembers crossing from Sonora to Arizona as a kid in the back of her parent’s pick-up truck. Even once in Arizona, from the rear window she had a clear snapshot of the vibrant curio shops along the streets and the colorful homes slowly crawling up the hillsides above the curved flatlands of Sonora. 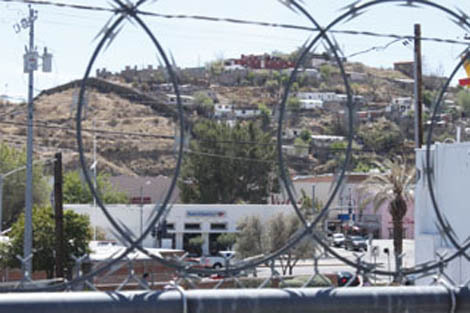 Now 45 years old and a new resident of Nogales, Ariz., the view is obstructed by fear and politics. Like other border residents and law enforcement agencies, Soto continues to declare that the border is safer than it’s ever been. And they are backed up by cold hard facts. Marta Soto looks toward the U.S.-Mexico border in Nogales, Ariz. during one of her many transits between the two countries.